We love picture frames! They are a natural extension of all the fantastic wood signs we make, and we offer a growing line of picture frames! Choose from a 4"x6" opening or 5"x7" opening for your solid wood picture frame. They come in two thicknesses, and a choice between a flat edge or a bevel edge—we have lots of great options! Check out all the fantastic sayings available! Like all our products, we make each and every picture frame in Eau Claire, Wisconsin. We also offer beautiful dark solid pine frames with natural bark edges. Each one is unique and makes for a beautiful rustic wood picture frame! 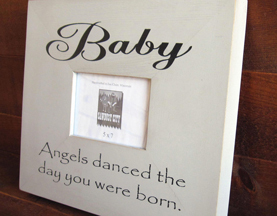 We can also make custom and personalized picture frames with your own saying or significant names and dates!